What's included in the @Home Training System? All @Home Training plans include a monthly membership to train an unlimited amount of time. You will receive all materials required to train (Quick-Start Guide, 10-20 paste, sensors, amplifier and software to download to personal computer or laptop). You will have access to an online portal for training and an online support forum moderated by expert trainers, access to regular check-ins with staff trainer via text, email, phone or Skype. You will be required to use your own headphones, if needed. Any headphones or earbuds will work with software program. *Please note that Professional Plans include all materials plus the qEEG Brain Map software and an additional Set-up and Quick-Start Guide. *Please note: Shipping costs are not included in the monthly plan and billed separately. We offer a flat-rate shipping cost anywhere in US (one way only). Return shipment is the renter’s responsibility. You can also pick it up for free at any of our SC or MA locations. How long before my equipment arrives? SYMMETRY @Home Training System has an approximately 3-4 week wait list to receive shipment due to the popularity of this plan. Our trainee’s can decide to extend the rental period; therefore, it’s difficult for us to know an exact date of availability. However, we stay in constant communication with current and wait listed trainee’s. We will be able to determine a time frame once a potential trainee is scheduled on the wait list. Contact us to complete the monthly membership form, submit deposit and you will be placed on the wait list. Is there any difference between the training between a SYMMETRY @Home session compared to an in-office session? No. Both use the same technology and applications. The only difference is that the @Home sessions will be more cost-effective and can be done completely at home or at your office and around your schedule. The Professional Plan will offer qEEG Brain Mapping with additional guides and support. I don’t feel anything during a session. How do I know it's working? Great question! 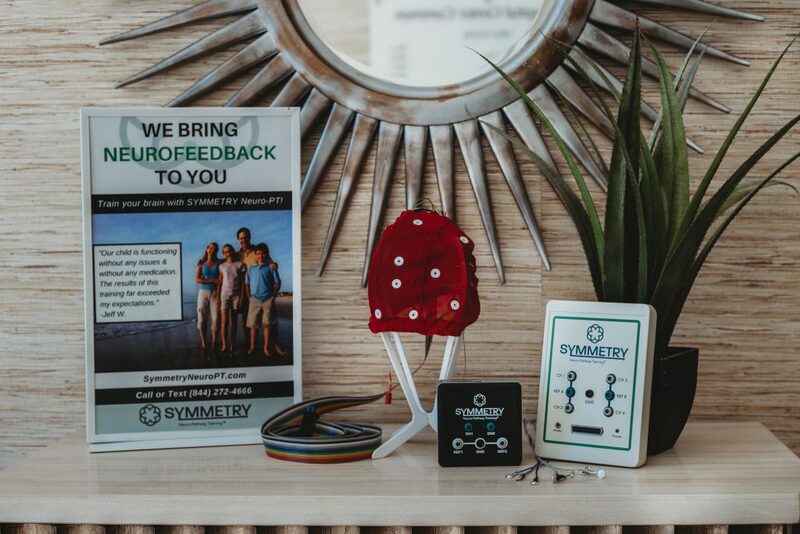 SYMMETRY Sage experts have created a comprehensive program that will record your training sessions, provide a quarterly symptom tracker and will monitor your progress through the program. These are checkpoints that create baselines to measure your progress so you will know your progress throughout the entire program. For example, we complete trackers that will measure areas of concern, these create a map on a 1-10 point scale that will show a trainee that may have scored high (10) but then will be measuring much lower (3) for a variety of symptoms. Is it difficult to download the program, place the sensors and run a session? We set up 3 coaching appointments, the first will go over how to set up the computer program, explain the amplifier, place the sensors prior to running a session. We run and monitor your first session. This will provide a quick overview of the manual and explain any questions you may have at that time as well. We provide video support if you forget any information that was discussed during the setup and guide appointment. The next two appointments are to monitor you running a session on your own and to make sure you feel comfortable with the program. Why is training for three months recommended? The minimum amount of time to rent a SYMMETRY @Home Training system is 1 month with unlimited sessions. This means you can train every day at least once for up to 30 minutes. We track your progress to make sure your brain is experiencing positive change. Some protocols you may be able to train for up to 45 minutes or twice per day. This depends on your needs and brain strength but SYMMETRY Sage professional ultimately will decide the length and duration and be in constant communication on how your brain is adapting to the new brain wave changes. You will begin to notice some changes in the first month, but the best training results occur when clients train consistently for approximately 3 months for at least 2 times per week. Practice and consistency is key for the brain to maintain the results you are training to achieve. Is it difficult to learn where to place the EEG sensors on the head? No, we provide an easy to use placement cap, that will have chin straps that allow you to find the placements quickly and place the sensors accurately each time. We spend time coaching you to show you how to correctly place the sensors and use the equipment appropriate.